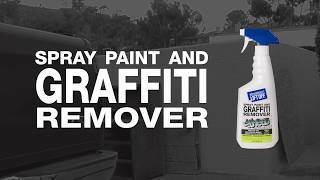 This biodegradable and water-based formula breaks the molecular bond between spray paint and the surface, making it highly effective. The versatile formula removes aerosol, enamel, acrylic, high- and semi-high-gloss paints—and can do it on a number of surfaces such as signs, Plexiglas®, street signs, vinyl and plastic, even porous surfaces such as brick and concrete. Spray, then wipe away instantly. Application: Chairs; Floors; Tables; Walls; Applicable Material: Cement; Fiberglass; Metal; Plastic; Tile; Vinyl; Dirt Types: Spray Paint; Scent: Neutral.